See a car accident off to the side of the road and chances are 50-50 that no one was hurt. See a truck accident, however, and you're much likely to hear the accompanying ambulance sirens. A head injury is common following a truck accident. Traumatic brain injury (TBI) victims often spend the rest of their lives suffering with the residual effects of a disability resulting from a blow to the head. Because the spinal cord helps to relay messages from the central nervous system to the rest of the body, any injury to the spinal cord can cause serious damage. In some cases, a full recovery is possible. In other instances, a spinal cord is so severely injured that the victim may be left completely or partially paralyzed. Even a simple bone break requires several weeks of healing. Some complicated breaks, such as broken vertebrae or crushed bones, will require surgery. In some cases, a limb may even be severed in the crash or need to be amputated at the hospital because the damage is too extensive. Damage to any of the internal organs can lead to life-threatening internal bleeding or countless other health issues. If you do recover, you may be plagued with ongoing health problems that greatly alter your quality of life. If you have been the victim of a Missouri truck crash, you are likely dealing with serious injuries that require extensive medical care. 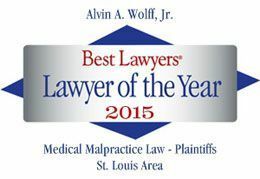 For help getting the compensation you need, call St. Louis truck accident lawyer Alvin Wolff, Jr., at 877-241-1020. When you set up your appointment, don't forget to request your free copy of The Guide On How To Pick a Lawyer.